Use of chemicals for growth enhancement and disease control in plants has resulted in hazardous influences to the environment and human health. Therefore, less harmful methods should be implemented and the possibility of using microbes for this purpose has been investigated. Endophytic fungal assemblages have been known to enhance plant growth and decrease disease incidence in some crops including rice and thus can be used as an alternative to chemicals. Therefore, this study was aimed to isolate the endophytic fungal communities associated with the rice variety Ld 368 with a view to examine the possibility of using them for plant growth enhancement and management of brown spot disease incidence. Brown spot disease caused by Bipolaris oryzae is one of the major rice diseases prevalent in Sri Lanka. Healthy plant parts of variety Ld 368 were used for the isolation of endophytes. 31 endophytic fungal species were isolated, and eight of the most frequently isolated fungal species were tested for their ability to inhibit the growth of B. oryzae using dual culture assays. From the fungal species tested, Trichoderma sp.1, Trichoderma sp.2 and Chaetomium sp. inhibited the colony growth of Bipolaris Oryzae significantly (P ≤ 0.05) under in-vitro conditions. Based on the results of in-vitro tests, spore suspensions of the more effective endophytes were inoculated separately to healthy Ld 368 seedlings to evaluate their efficacy in controlling brown spot disease and to determine their effect on rice plant growth under greenhouse conditions. Two inoculation methods (i.e. seedling and soil inoculation) were used to identify the best approach to introduce the endophytic fungi into the plants. Plants inoculated with Trichoderma sp.1 and Chaetomium sp. using seedling inoculation method showed the lowest disease incidence as well as a significant difference (P ≤ 0.05) in shoot length and fresh and dry weight of plants. 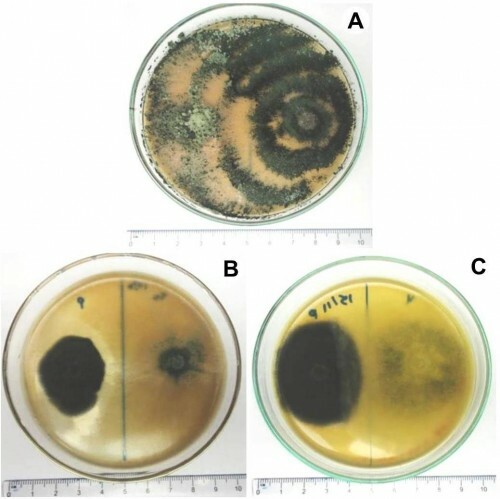 These results indicated that the tested endophytic fungal sp. have the ability to control brown spot disease incidence and enhance plant growth of rice variety Ld 368. Fig. : Endophytes and Bipolaris oryzae in dual culture showing antagonism colonies.